The romantic dream of staying in a log cabin can be fulfilled when you stay at Cosy Cabins, where 2 one bedroomed log cabins are nestled on the hillside in a pretty garden with sea views on the inland side of the main road in Southport. 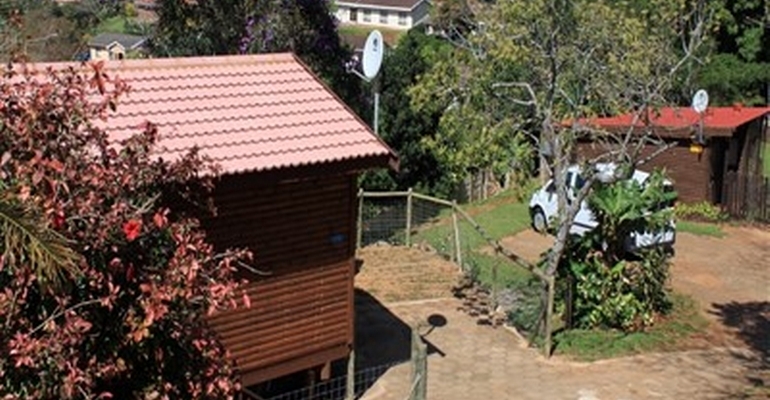 The log cabins provide ideal holiday accommodation for small families, but are also frequently utilized for their convenience by people working on contract in the Port Shepstone area. Cosy Cabin 1 has a double bed in the bedroom plus a sleeper couch in the open plan living area. The bathroom has a bath with telephone shower. This is a small unit, suitable for a couple or a family with a maximum of 1 teenager or up to 2 smaller children. The larger Cosy Cabin 2, which has beautiful sea views from the deck sleeps 5, with 2 single beds in the bedroom and one single bed and 2 bunks in the living area. It has a shower in the bathroom. Both units are fully equipped with stove, fridge, microwave, kettle, toaster, iron etc, and TV with OVHD, wired for you to bring your own DSTV Decoder and smartcard. The garden is fully fenced and gated and an alarm system is installed in each unit which also has its own braai. All bed linen is provided, but we request that you bring your own towels, toiletries, and provisions. This is a very peaceful area for nature lovers with wonderful birdlife and monkeys who frequently come into the garden to steal from our fruit trees. Cosy Cabins are pet friendly on request. 2 Log Cabins - Sleeping 3 & 5. Ideal for Nature Lovers with Abundant Birdlife. R500 breakage deposit for all bookings which will be refunded, less a R50 admin fee, within 7 Days of departure. Check in is at our offices at 10 Norwood Road Umtentweni. Directions to Cosy Cabins will be given there.